and a servery with prepared foods cooked at their Bronx based commissary delivered early in the morning. 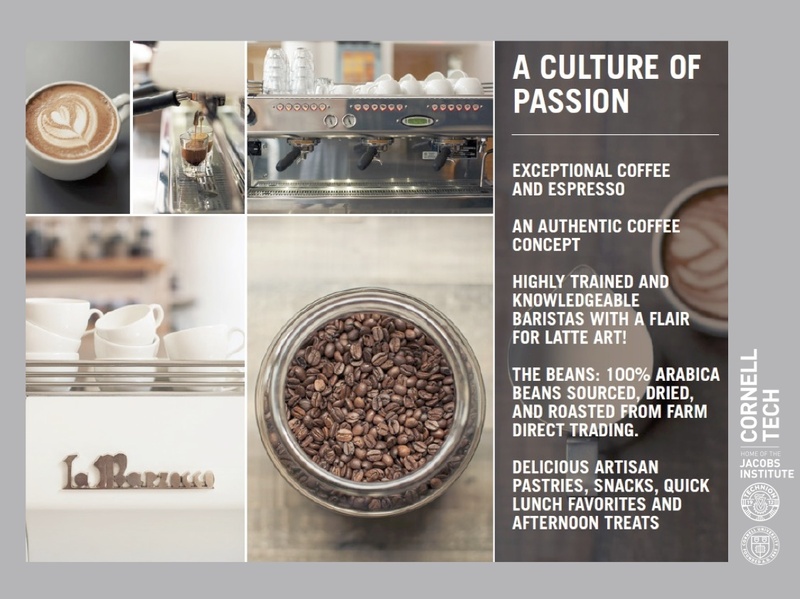 The Cafe plans to offer a variety of healthy and delicious food, including breakfast, grain bowls made to order, salads, soups, and sandwiches. Starr Catering's Guy Kellner previewed the new Roosevelt Island Cornell Tech Cafe during March 29 Roosevelt Island Town Hall meeting. 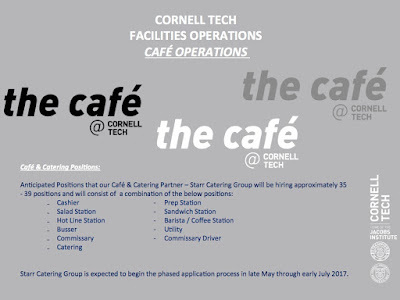 Click here for more information on jobs available at the Cafe and other Cornell Tech vendors. 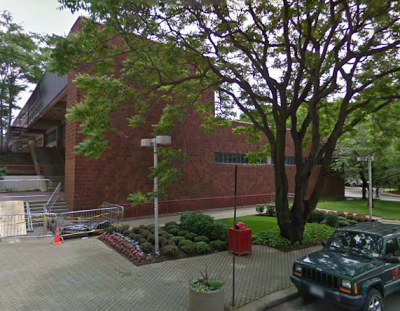 This summer will hopefully see two additional restaurants/cafes opening on Roosevelt Island. 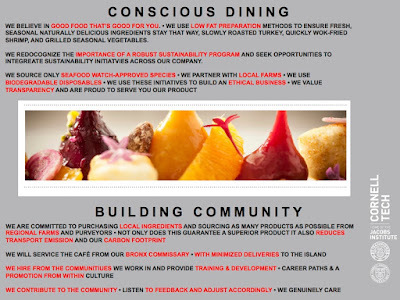 As previously reported a Mexican restaurant and Cafe/Juice/Wine/Beer Bar will open this summer too. 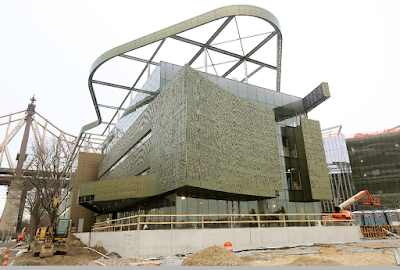 Maybe even Trellis/Nisi will finally open this summer. 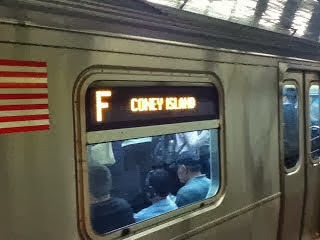 That's 17 weekends in a row of Roosevelt Island F train service to and from Manhattan. The last Roosevelt Island weekend F train service disruption was December 16-19, 2016. Here we all go once again. The summer months are upon us all - and low & behold the gangs are slowly starting to congregate in the hallways . Since Friday alone PSD was notified (16) times as it relates to these young kids being allowed to just loiter in the buildings without being asked to leave. Concern grew upon the possibility that NYPD's 114 Precinct community patrol officer assigned exclusively to Roosevelt Island was removed. 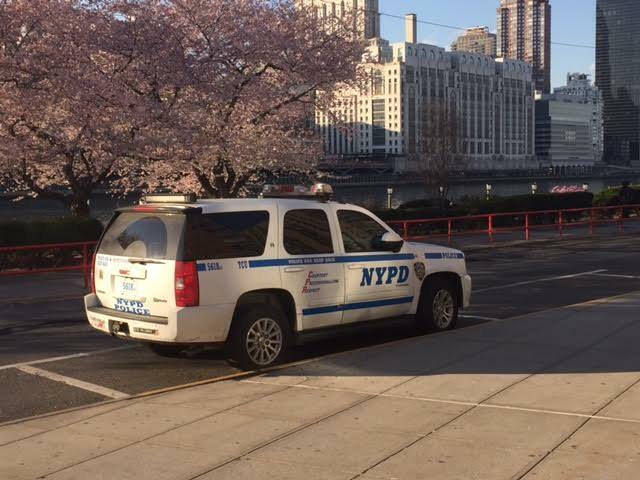 I've been told that Roosevelt Island no longer has a 114th NYPD Community Police Officer assigned exclusively for Roosevelt Island. Is that true? If true, why? 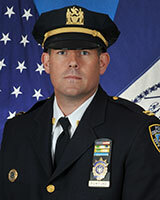 In 2011, the NYPD 114 Precinct Commander fulfilled a promise to assign a full time Community Office to Roosevelt Island. The 114th Precinct went to the new module of community based policing in October 2016. This module of policing is broken down into Steady Sector Officer's, Neighborhood Coordination Officer's (NCO's) and response auto's. 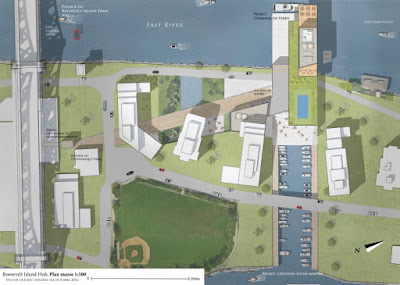 Roosevelt Island is zoned in Sector David (sectors are defined zones within a command) and has two (2) permanent NCO's assigned to cover that sector. Steady sectors are given several hours a tour "off-patrol" time, meaning they attend community based meetings, conduct community outreach, or whatever else specific to their sector needs to be addressed. The NCO's are tasked with coordinating with the residents in their sector, such as; attending community based meetings, identifying specific community issues, formulating solutions to those problems, just to name a few. We have held several "roll out" meetings, and still trying to get more community residents engaged in the program. So the short answer to your questions, is the information you received is not true. Deputy Inspector Fortune encourages Roosevelt Island residents to get to know the NCO's assigned to our community and let them know about specific problems and issues. Sector David covers from 21 Street to Vernon Boulevard, Astoria park South to Queens Plaza North and all of Roosevelt Island. works in a Queens housing project. 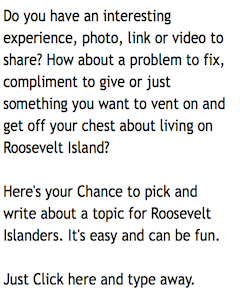 Let's see how it works on Roosevelt Island. We have been informed that the NYPD 114th precinct is currently reorganizing to expand their community policing program to additional neighborhoods which will affect Roosevelt Island. 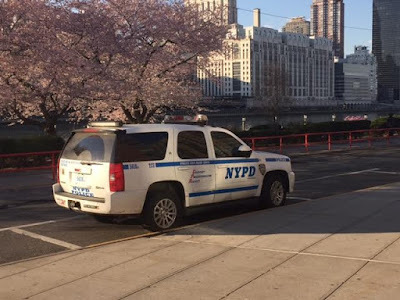 The tours for Officers Joseph Esposito and Keith Matthes, Neighborhood Coordination Officers (NCO) assigned to Roosevelt Island, have been expanded to include 21st Street to R.I. and Astoria Park South to Queensboro Bridge. Although the island will continue to have a NYPD presence, the change will affect the frequency of our NCO’s on the island. Officers Matthes and Esposito will continue to be available for community meetings and as needed. To help with this transition and to properly provide the community with continued dialogue, the 114th precinct will host a community meeting on May 25th at 7 PM at the Queens Library at Long Island City, 37-44 21st Street. Click here for the full Curbed NY article. 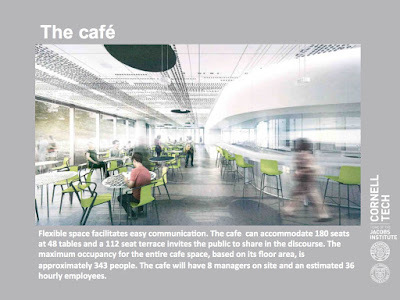 The design reminds one Roosevelt Island resident of Starfleet Academy. Roosevelt Island is no stranger for wacky ideas by architects. 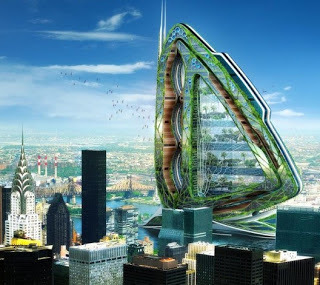 with East River Pedestrian Bridge? Starr Catering Group is hiring food service personnel for the Bloomberg Café. 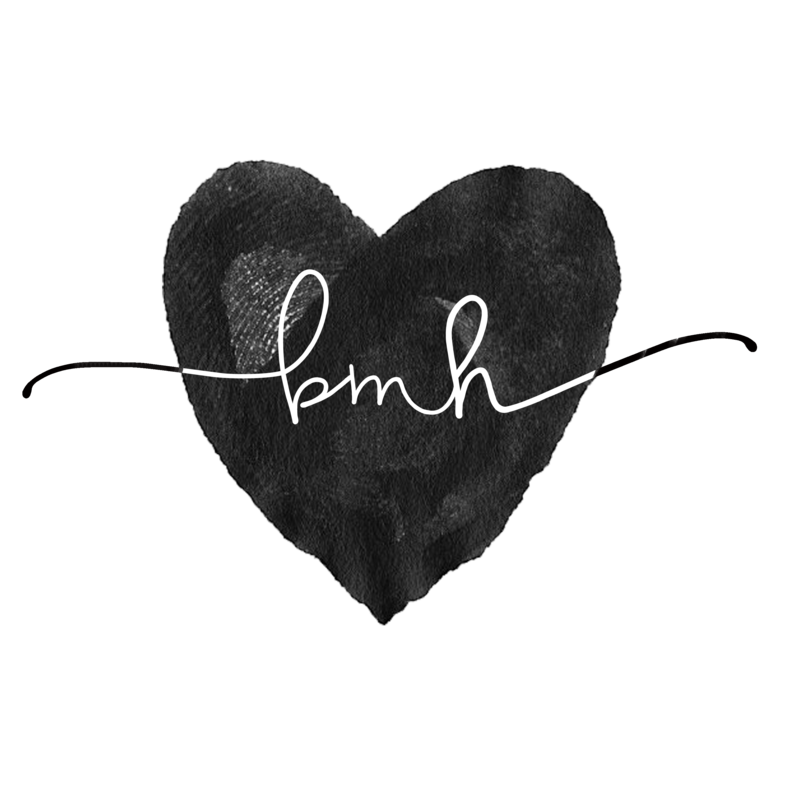 Please check back for details on May 1, 2017. Related Management Company is hiring buildings care personnel for our residential building The House at Cornell Tech. Please check back for details in late May 2017. Cornell Tech is identifying a contractor that will be hiring facilities maintenance and management personnel including groundskeeping, buildings care, and facilities operations positions. Please check back for details in early June 2017. 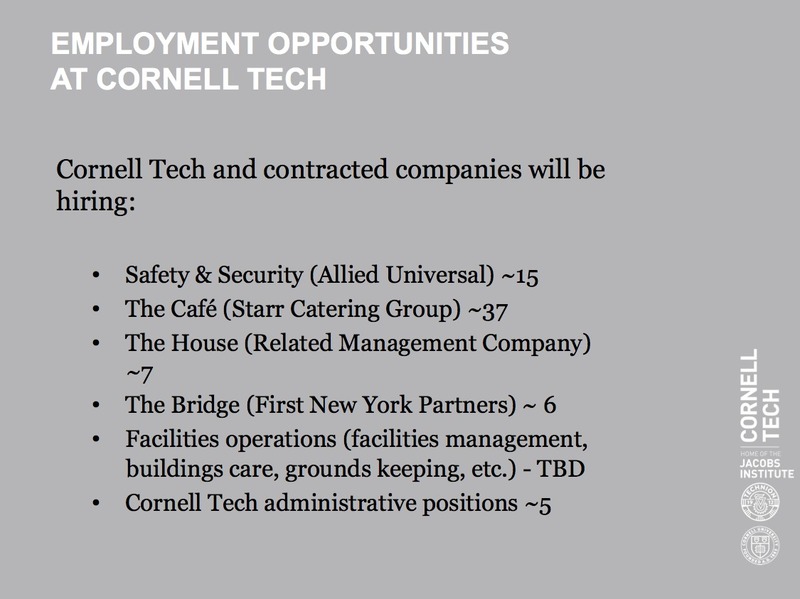 During March 29 Roosevelt Island Cornell Tech Town Hall Meeting, Cornell Tech's Director Of Human Resources Julie Delay reported on campus employment opportunities. Here's what Ms. Delay had to say. 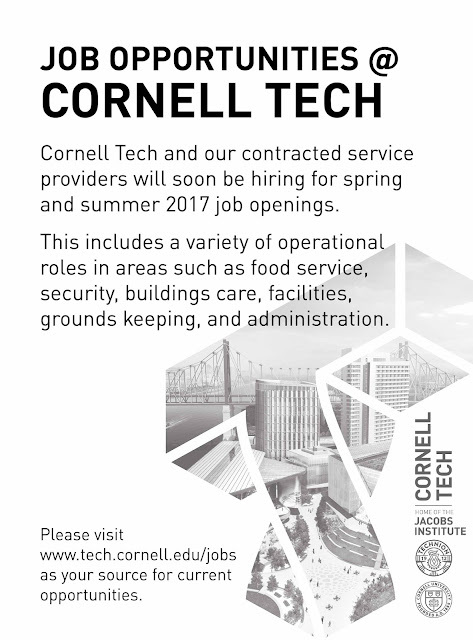 Click here for more information on Cornell Tech campus employment opportunites. 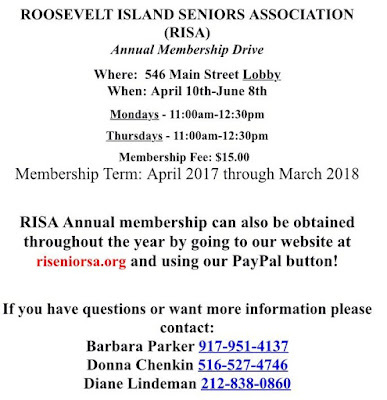 Roosevelt Island Seniors Association (RISA) President Barbara Parker reports the RISA annual membership drive is underway for residents 50 years of age and older. 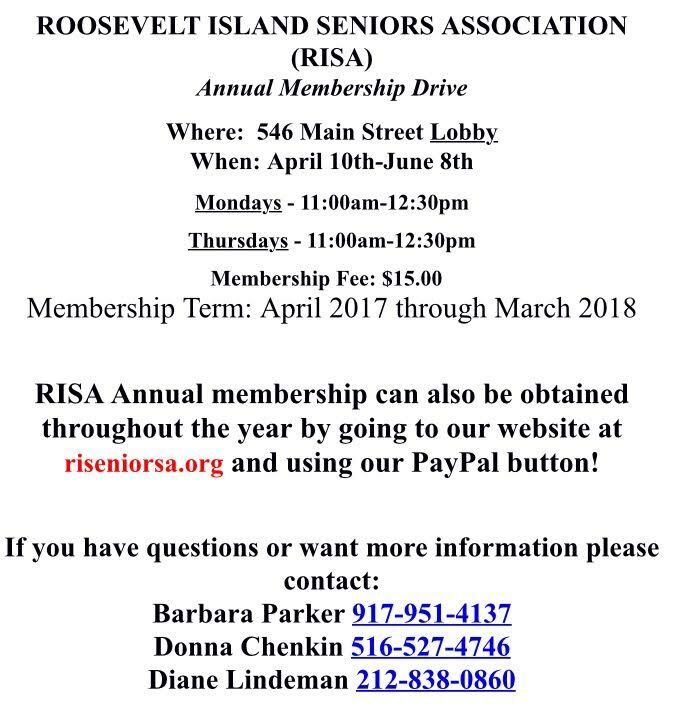 RISA Annual membership can also be obtained throughout the year by going to our website at riseniorsa.org and using our PayPal button! During the March 23 Roosevelt Island Operating Corp (RIOC) Board Of Directors meeting Public Session, RISA President Barbara Parker spoke about RISA's recent re-organization and new programs. Also, new RISA Board member Lorraine Altman reported on the new face of RISA including developing programs for active seniors. 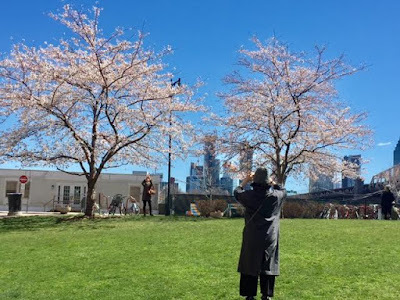 The Roosevelt Island Cherry Blossom Trees are in bloom right now. They are fantastic. The last couple of days, Roosevelt Island has been been full of people visiting and taking pictures of our Cherry Trees. Last Saturday, I took a walk under the Roosevelt Island Cherry Trees on the West Promenade next to the East River and the Cornell Tech construction site. Join me in a virtual walk under the Roosevelt Island Cherry Trees. 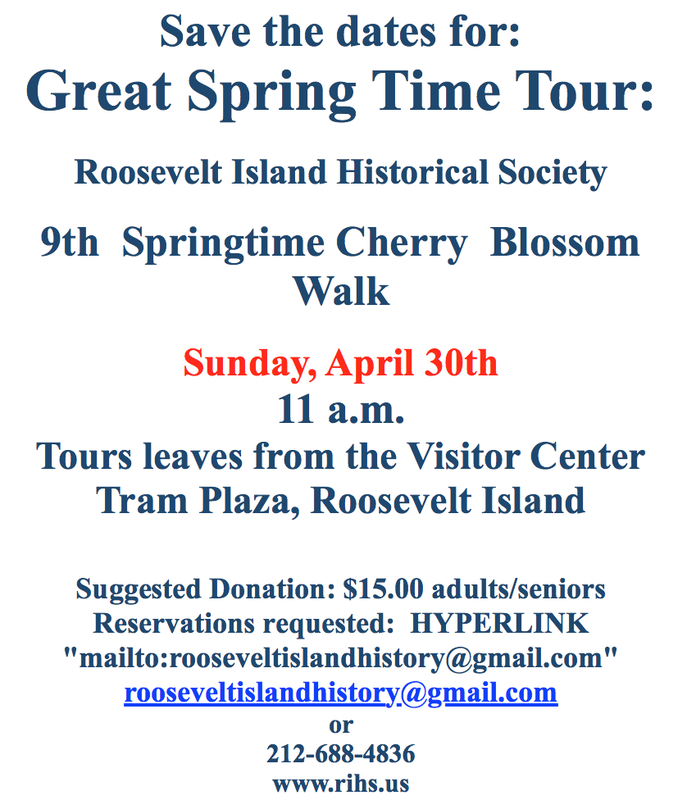 Don't forget the annual Roosevelt Island Historical Society Cherry Blossom Walk on Sunday April 30. The Roosevelt Island Twitterverse has more Cherry Blossoms. to raise funds for Syrian refugees at last Saturday's Roosevelt Island Farmers Market. 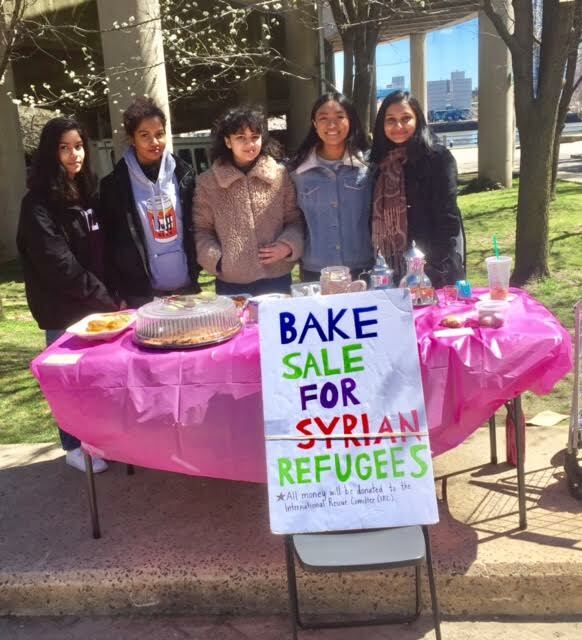 Ms Kaoutar decided she had to act, do something, to help people caught in this humanitarian crisis and came up with the idea of reaching out to her community on Roosevelt Island with a fundraising bake sale that she hopes to continue in the following weeks. The money raised goes to the International Rescue Committee. I spoke with Ms. Kaoutar at the Farmers Market. Here's what she said. 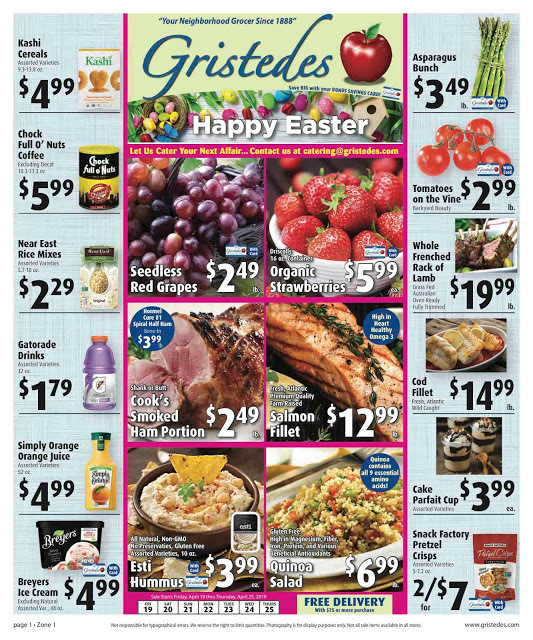 available at their web site. 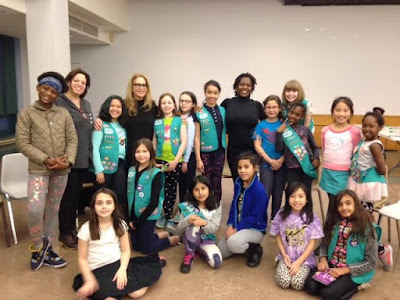 Last Monday, two Roosevelt Island female business owners visited our Junior Girl Scout meeting to share their experiences owning and running a small business and provided mentor advice to the girls for designing their own business. The fourth and fifth grade girls in our troop are working on their Business Owner badge and these two women professionals helped them complete two of the five requirements necessary to earn this badge. Nina Freedman, architect and owner of Dreamland and Beauty Freemantle, acunpuncturist and owner of Island Acupuncture and Wellness exposed the girls to two very different types of careers. They described what they do in their respective job, shared the joys and challenges of running their own business and explained education and training is needed for their career. The girls were particularly fascinated with seeing the tools of the trade that Nina and Beauty brought - especially the small scale models of apartment interiors used to design re-models and the needles and suction cups used for acupuncture. Nina and Beauty's panel discussion helped excite the girls to think about how to turn something they love to do into a business of their own. The girls each wrote a brief plan describing their own business ideas. Nina and Beauty then worked with the girls individually to help them think through ideas for their own small business and provided feedback to the girls on ways they could improve their plans. A very special thank you to Nina and Beauty for helping inspire our next generation of women entrepreneurs! please be advised that due to unforeseen circumstances the sports park pool will remain closed until further notice. the sports park gymnasium will still be open tomorrow, Monday April 9th. we apologize for the inconvenience. 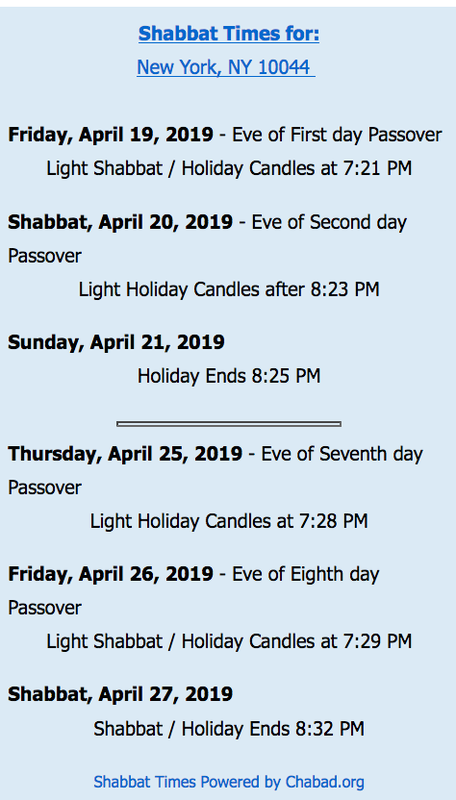 RIOC meant Monday April 10. What happened. What were the unforeseen circumstances? Will update when answer is received. What is going on at the Sportspark? We were very disappointed to discover that the pool had a leak in it which flooded the engine room Saturday. There is substantial damage which is still being assessed today, this week. 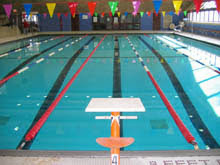 The pool was half empty when the staff arrived and they had to pump water out to the engine room all afternoon Saturday. We have RIOC staff, contractors, plumbers and electricians all addressing the issue. We will have a better assessment this week of what we are dealing with.